Out of context, this box could read "old" or "oid", not sure. 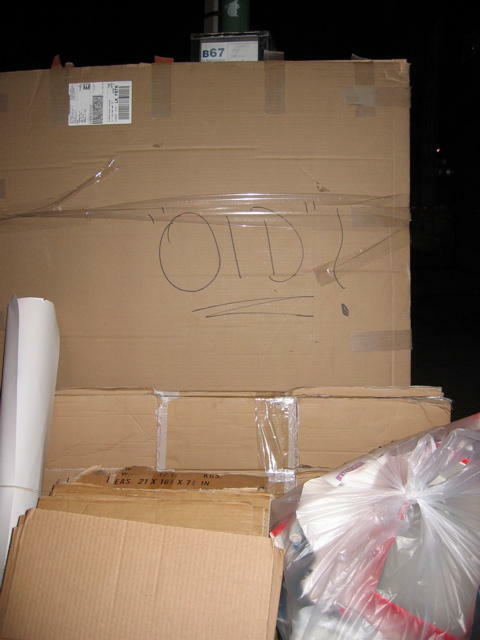 I'm assuming it says "old" because a) "oid" is not a real word, and b) here in Brooklyn, in the days immediately following the first of the month, you will find the sidewalks cluttered with lots of stuff that people have put out to the curb after moving into their new apartments. This box was probably used by a tenant to separate his "OlD" junk from the things he wanted to keep. I like the way "OlD"? is written in quotes and with a question mark, as if the writer intended to draw attention to his own bizarre usage of lowercase L!